Any partnership doing business in Louisiana or deriving any income from sources therein, regardless of the amount and regardless of the residence of the partners, must file a Partnership Return of Income, Form IT-565 if any partner is a nonresident of Louisiana or if any partner is not a natural person. 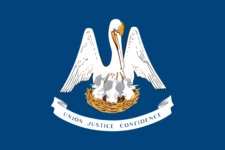 If the partnership has income that is derived from sources partly within and partly outside of Louisiana, an Apportionment of Income Schedule, Form IT-565B must be filed with Form IT-565. Never forget to file LA IT-565B again.